Contractor specializing in roofing, siding, gutters, windows and overhead door installation. Weathercraft has a professional sales force and quality installers who specialize in the different products that we offer. Weathercraft of North Platte was founded by Alan Erickson and Bill Livengood in 1976 as a branch office of Weathercraft of Lincoln, NE, . In 1983 Erickson became the sole owner and we began operating independently of the Lincoln office. Since then, we have steadily grown to 15 locations in five Midwest states. Alan sold the company to Scott Erickson and Joe Staroska in 2006. Today the company is owned and operated by Scott Erickson and Joe Staroska, both originally from the North Platte area. Weathercraft has been a Firestone Master Contractor since 1990. As a local contractor, we pride ourselves in having local people to support our customer base. Click on LOCATIONS to see where we are. 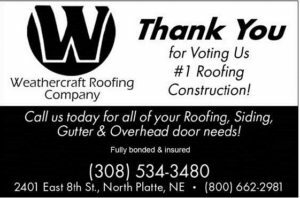 Here at Weathercraft, we have the experience and knowledge to identify your roofing problem and find a solution that suits your needs. Weathercraft brings big-city quality and options to the rural regions that make up our territory. Weathercraft is not a single-source contractor (with only one product to sell you). Please visit our PRODUCTS tab to browse our multitude of products and solutions. Weathercraft fully understands property insurance claims from hail or wind, and is experienced in working with insurance companies to make the process as painless as possible for a building or homeowner. If you are interested in receiving a free estimate or bid, please CONTACT US. You will discover how easy it is to work with Weathercraft.